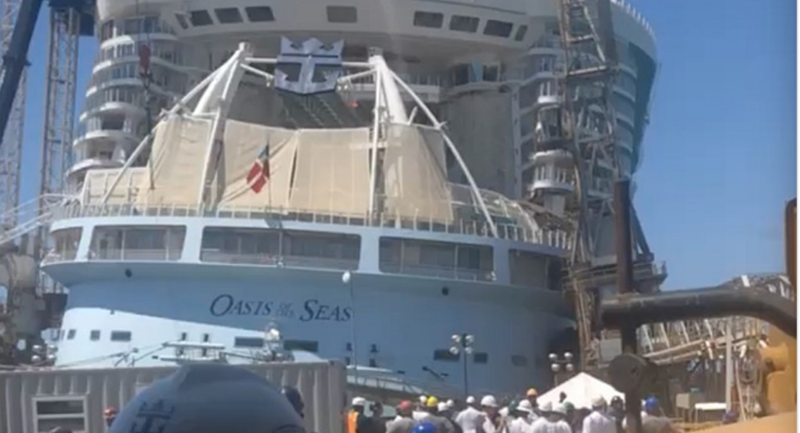 "We are responding to a construction site incident at the Grand Bahama Shipyard, where Oasis of the Seas is currently in dry dock," Royal Caribbean Cruises said about its ship in a statement Monday obtained by multiple news sources. ​"As of 1:45 p.m. EDT, we are accounting for the whereabouts of all site personnel and working with local authorities to determine if there have been any injuries. We are aware of damage to the dock structure and to construction cranes. We are assessing damage to the ship," the statement continued. The ship, which is 1,200 feet long and can hold up to 6,300 passengers, was out of service and in a dry dock with its azipods (propulsion units) undergoing maintenance at the time of the incident, according to Cruise Fever. As a result, there were no passengers on board. However, at the time, it is unknown how many construction personnel were on the ship when the crane fell, striking the Oasis' starboard. According to Cruise Fever, a few construction workers suffered non-life-threatening injuries. The Bahamas Press reports that no deaths resulted from the accident. ​"Collapsed ship, dock collapsed, crane collapsed," said one shipyard worker in YouTube video. "I was right there on the dock working and just missed it by the grace of god." ​Oasis of the Seas typically departs from Port Canaveral, Florida, to embark on week-long cruises to the Caribbean.